Just as regular trips to the doctor and dentist are vital to keep your body operating at its best, your manufactured home or modular home needs regular maintenance, too. One of the most important things you can do for your home is one of the simplest and most easily forgotten: replacing the air filter in your home every month. 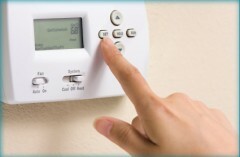 Feel like you are always turning your AC up? Check your filter! Keeping the HVAC equipment in proper operating condition is important for both optimum comfort levels and minimal energy bills throughout the year. It is also critical to maintain a clean air filter month after month to ensure that your home comfort levels are optimal for your family and that your energy costs are minimized. Over time, dirt and debris can build up on the coils or heat exchangers , making the HVAC system work harder and reducing its efficiency. This leads to additional operating strain on your equipment, decreasing its lifespan and elevating the risk of a system malfunction. A dirty, clogged air filter will also increase the costs of heating and cooling your home. Here is a short video on how to change your air filter in your manufactured or modular home. In addition to adding the air filter change to your calendar, one other way to avoid missing a filter change is to buy 12 air filters at a time and put a different month of the year on each of them. Then place them in a conspicuous place in the garage where you will see them regularly. This makes it easy to see when you last changed the filter and avoid missing a month. When you’re ready for a new home, Palm Harbor Homes is here to help. With customizable floor plans to suit every need and budget, Palm Harbor can help you find the perfect structure to build on your land, whether it’s a home, a beach retreat, or a hunting lodge. For more information about building on your land, manufactured homes, and modular homes, connect with us at PalmHarbor.com, Facebook, Twitter, and Google+.